Chosen Women of the Bible. 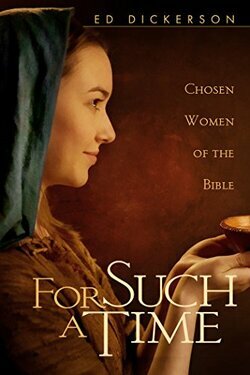 For Such a Time: Chosen Women of the Bible. It is this question that led author Ed Dickerson to investigate over a dozen Bible women who took the initiative in certain situations. Tamar (Judah’s daughter-in-law), Jochebed, Rahab, Deborah, Ruth, Hannah, Abigail, Bathsheba, Woman of Shunem, Esther, Mary of Nazareth, The Woman at the Well, The Bleeding Woman, The Syrophoenician Woman, Mary of Bethany, and Mary of Magdala each have a chapter that looks at their actions and how God responded to these actions. Ed has a high view of Scripture and he has immersed himself in the biblical narratives where these enterprising women appear. He highlights elements in the text and explains them without adding to the stories; he doesn’t embellish the stories with fiction. Through Ed’s writing, I learned many new things, even some astonishing things. (More on this in my next post). And my understanding of these women—and how God worked through them and blessed them—has been enriched. As with any book, I don’t agree completely with everything it contains, but the few points where I have a different view are very few. Also, there is no denominational bias in the writing. One thing that stood out to me, though, was that Ed regards women, to some degree, as “mysterious” and that they may use “feminine wiles.” As a woman reading the Bible, I’ve never felt that the female characters, in general, are more inscrutable than the male characters. And I’ve never felt that the Bible suggests any of the women in Ed’s book use especially feminine methods to achieve their results, if we exclude motherhood. Ed’s honest admissions about the differences he sees between men and women are thought-provoking. In the final chapter, Ed relates what he has discovered by studying the women’s stories. Here is a snippet of one of his findings. For Such a Time is well-written and aimed at the average reader, especially American readers. (There are several analogies used in the book about American institutions such as the Oval Office and Pony Express.) I am glad I read it. It is a worthwhile book for anyone wanting to learn more about these Bible women, their part in the history of God’s people, and the implications of God’s responses to their actions. For Such a Time is available on Amazon here. Ed Dickerson holds a master’s degree in religious education from Andrews University (in Michigan), a Seventh-day Adventist institution of higher education, and he is executive director of Grounds for Belief, a ministry devoted to retaining and empowering young adults. Ed mailed me a copy of his book with no obligation on my part to review it. I’m glad to recommend his book. (By Ed Dickerson).